Coronado SM Remote adjustment - SolarChat! I have been absent many years from this forum. 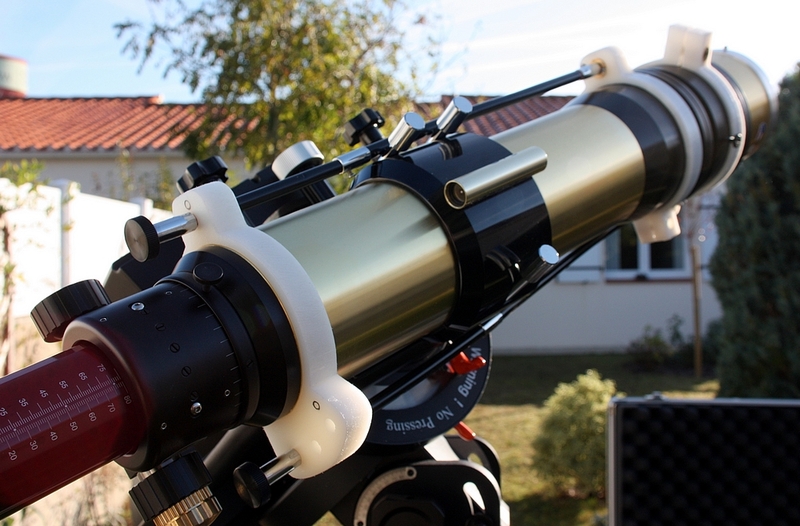 Lately I have started again with Solar imaging but already in December 2012 I modified my double stacked Coronado SM60. I can now adjust them remotely while sitting in front of the PC monitor and check the adjustment results. Below some images of how I solved it. Nowadays with the Arduino it is relatively simple to make it. That's a very interesting (and complex looking) option to achieve remote tilt control. Good evening everyone, a photo of my Maxscope Coronado 90 double stack, and its T-Max tuning system. That's nice! More pics please Jef! I sent you an email a few months ago asking about the brass portions of your excellent set-up but I never received a reply. When you have a moment, can you please help me out by informing where I can purchase the brass hardware? I can easily produce the remaining components.